If you’d rather go to a motorsport show in SE England than trek to the NEC in January, this weekend sees the London Motorsport Show at the Excel International Exhibition and Conference Centre (December 9-10). Radical Sportscars will be well represented, with examples of the new PR06 Prosport, the new Radical Biduro Spec SR4 and the Le Mans racer, the SR9, all on display. The PR06 (above, in action at Croft) maintains many of the styling cues of the original Prosport, but an all-new chassis and aero package ensures that the ten year old design is bang up-to-date. The price is also new with a fully spec'd, ready-to-race car retailing at a very competitive £26,500 + VAT. 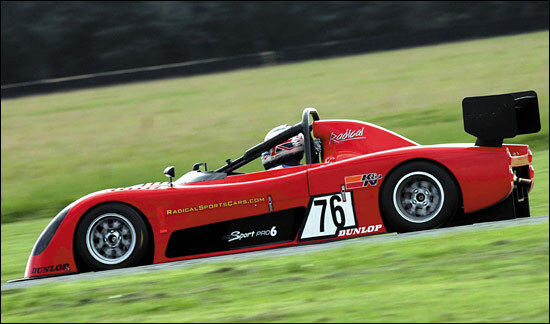 In the UK a 1000cc PR06 lapped faster than the old 1300cc Prosport on its maiden outing, while a 1300cc version left all in its wake during two 30 minute and one 90 minute race at Barber Motorsport Park in the US recently. The PR06 is eligible for the Radical Powertec Challenge, and the Radical World Cup, as well as regional Radical series across Europe and the US. A new Powertec Suzuki-powered SR4 will be seen for the first time this weekend. The 2007 spec SR4 will run in the televised Dunlop Radical Biduro Championship, as part of the Dunlop ‘Great & British’ Motorsport Festivals package. The new Suzuki Hayabusa-based, Powertec-developed motor, has been mapped to match the power of the ZZR unit it replaces. London Motor Show - no list of exhibitors there, but John Hartshorne's TVR is certainly on display. Take your cheque book and you could come away with it!